January is show time. 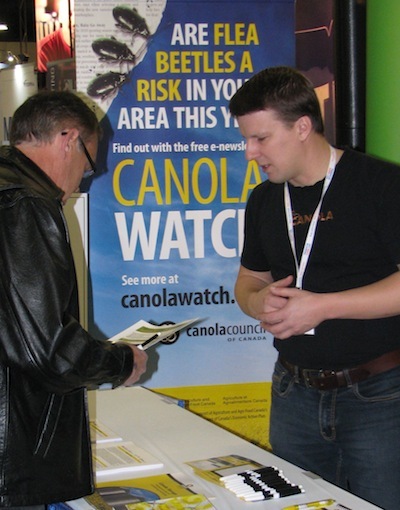 You can find Canola Council of Canada agronomy specialists at AgDays, CropSphere, Crop Production Show and FarmTech this month. January is also when growers often research and pencil out their final plans for the upcoming crop year. See our crop rotation and crop nutrition articles below for some added guidance. Big news! 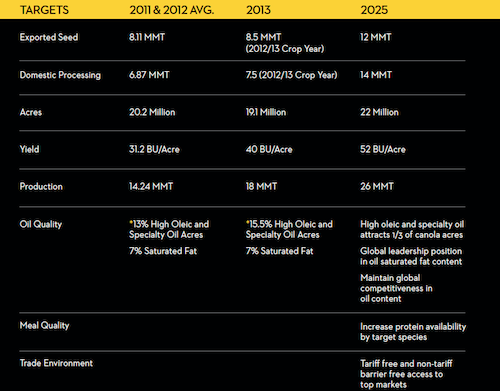 The Canola Council of Canada has a new strategic plan for the next decade. The goal is to reach an average of 52 bu./ac. across the Prairies by 2025 and of course have the markets in place to move all that canola. This will mean a whole new approach to the way Canola Watch and the CCC in general delivers agronomy messaging. Once size does not fit all. See more at Keepitcoming.ca. Reminder to CCAs and CCSCs: If you want 2014 credits for the Canola Watch exam, you have until January 31 at midnight to write. Canadian canola production surpassed the industry target of 15 million tonnes. The next goal, announced today, is 26 million tonnes by 2025. This is based primarily on an increase in yield per acre, with very little increase in overall acres of canola. An average Canadian yield of 52 bu./ac. over 22 million acres will achieve 26 million tonnes of production. Rotation between canola crops has known benefits for management of blackleg, clubroot and root maggot and an overall improvement in canola yield. A one-year break between canola crops provides a clear yield advantage over back to back canola, according to crop insurance data. A two-year break improves on blackleg management when compared to a one-year break. (The graph above is from a Randy Kutcher AAFC study featured here.) A longer break is also better for clubroot, however rotation alone is not a practical way to manage clubroot once it has arrived on a farm. Crop rotation as well as using a clubroot resistant variety, limiting soil movement and controlling clubroot-host weeds are all required. 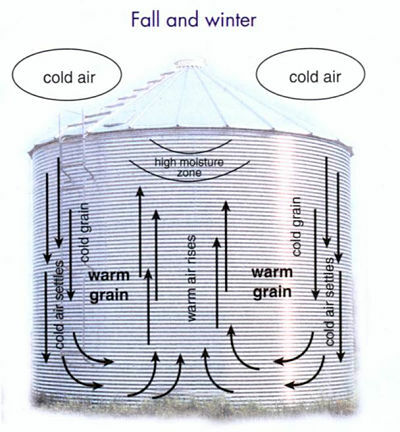 Nutrient reserves vary from field to field, and from zone to zone within each field. 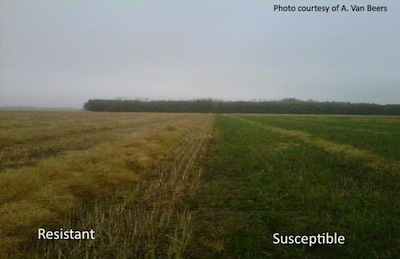 This has encouraged some growers to create different blends for each field, and to use variable rate application to adjust rates based on management zones within a field. A soil testing program is essential to determine the right blend for each field. The question, from an overall profit perspective, is what return can one expect from varying these rates, given the investment of time and money in soil tests, in variable rate equipment, and in handling and preparing all the different blends? For some growers, one blend might be the most practical option. Do you need a clubroot-resistant variety? The Canola Council of Canada is hiring three Agronomy Specialist Summer Assistants for 2014. These assistants will get practical experience in the field, and get to take part in Canola Watch calls and discussion. There will be one position in each of Manitoba, Saskatchewan and Alberta. Location within each province is negotiable. CCA Quiz 2013 answer key The Canola Watch 2013 exam for Certified Crop Advisors (CCAs) and Certified Crop Science Consultants (CCSCs) is over. Feel free to take the exam for an agronomy refresher, but credits are no longer available. For more information and to take the exam, click here.